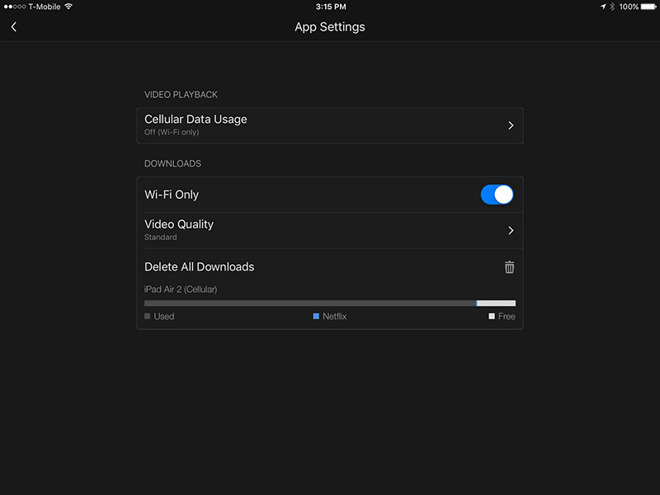 A feature you're bound to see more of in streaming video apps is support for offline caching —that is, the ability to temporarily download a show or movie so you can watch it later without internet access. 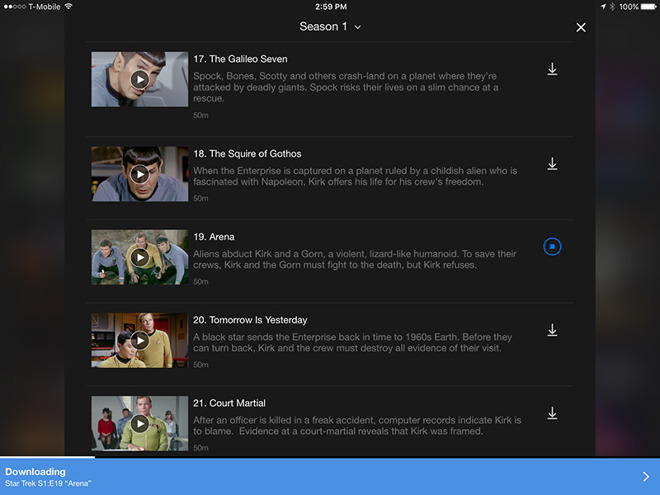 Here's how to do it for Netflix, one of the most popular video services on iPhone and iPad. Right off the bat, the most important thing to remember is that not everything can be downloaded due to rights issues. 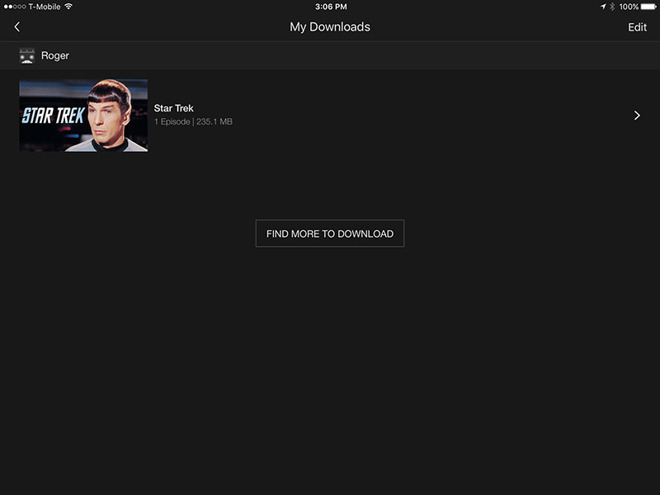 So while you can download "Mulholland Drive" or episodes of the original "Star Trek," you can't download "Archer" or "Captain America: Civil War." Netflix Originals like "Stranger Things" are typically compatible. Before initiating any downloads, it's probably wise to visit the App Settings screen, which you can find towards the bottom of the list opened by the home screen's Menu button. Here you can restrict downloads to Wi-Fi, delete all of your cached material at once, or change quality settings. There are only two quality options however, Standard and Higher. You should probably pick Higher only if you have ample free space and you want maximum quality, say if you're watching on 12.9-inch iPad Pro. 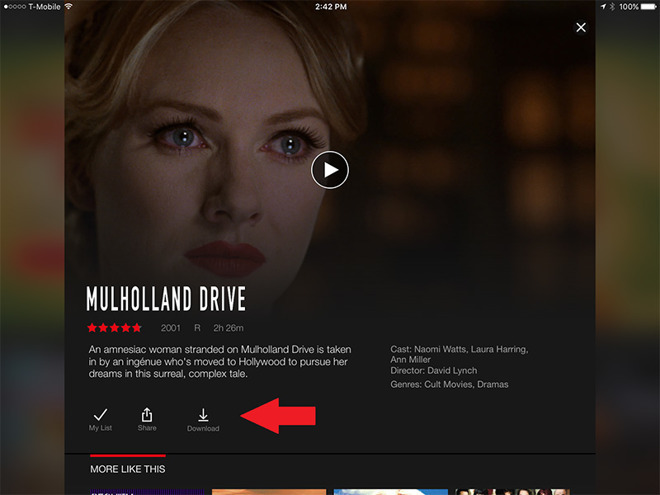 If you're searching specifically for offline material, Netflix has made this somewhat easier with an Available for Download option. Tap the Menu button in the upper-left corner on the home screen, and it should be one of the first items near the top. This creates a filtered version of the normal browsing interface, complete with categories and recommendations. Alternately, if you already know what you'd like to download, you can simply search for an item manually and cross your fingers that downloads are activated. Offline caching is simple. 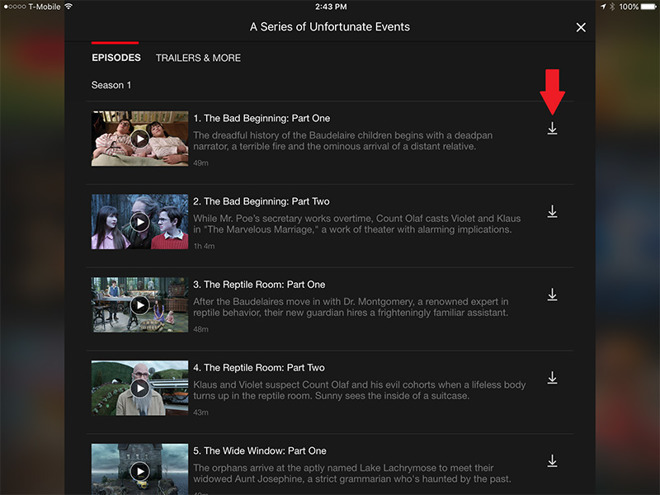 Once you've selected a title to bring up its description, you'll see a Download arrow somewhere onscreen. Typically this is front-and-center for a movie, or next to each episode in the case of a TV series. Tap an arrow and a progress bar will appear as the video is saved. 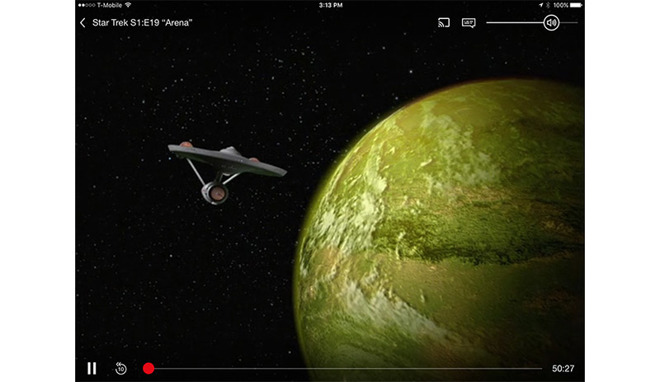 Downloading is best done over Wi-Fi, naturally, unless you have an unlimited data plan, since a even single episode of "Star Trek" can be over 235 megabytes. Also, be aware of how much onboard storage you have —people on 16-, 32-, or even 64-gigabyte devices can quickly find themselves running out of space if they save several shows or movies at a time. Tapping on a completed progress bar will bring you to the My Downloads screen, which is also accessible from the Menu button. This is where you go to actually watch offline videos, or by tapping the Edit button in the upper-right, delete them to clear up space. 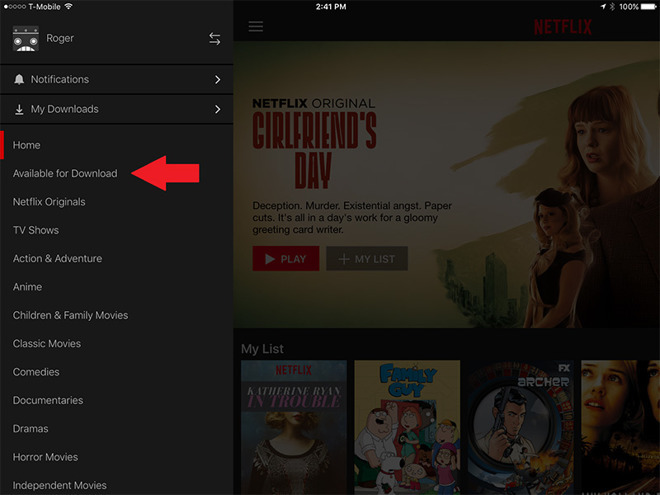 Finally, be aware that you'll need an active subscription and the latest version of the Netflix app, which runs on devices with iOS 8 or later. Caching isn't available on the Apple TV.